Sam, Eric, Schulz, and Jonathan are four friends living in a surburb of Munich, Germany. They mostly hang out at the skateboard park, a group of lost boys, adrift. Eric, who has been kicked out of school, and then out of his house, leads the pack. One day the foursome decide to break into an abandoned house. Though the experience is pretty creepy, they keep returning—because each time they do, they find more money, hidden in many place all over the house. In short order, they are pretty rich for teens, and they drift around town spending the money—at first at McDonald’s, and later on less innocent pleasures. The guys’ sudden wealth turns out to have some dark effects as they are pulled further into drugs, clubbing, mental illness, and betraying one another. It’s like the wish granted by the genie that turns out to ruin lives. Mattheis actually had this experience in the 1990s. He decided to fictionalize it a bit, but on the whole, he tells his story, He includes an introductory note for American teens, explaining how teen guys could get alcohol so easily (the unaccompanied minor drink age in Germany at that time was 16 years, but even that wasn’t enforced). And, of course, he changes the names of his friends to protect their privacy. High school housekeeping: How to Lose Everything is advertised as a story about the fall from innocence, but I think that’s not true. Before these guys find all this money, they are already smoking cigarettes and marijuana, drinking alcohol, hanging out with little or no plans. Eric’s goal is to become a drug dealer. They really are adrift. I think what makes the book worth reading is how we see these lost boys react to the money they find. Because they don’t have a stable foundation of ethical behavior, they speed down the path they are already on, making wrecks of their lives. Obviously, Mattheis pulled himself together (anyone who studies philosophy, which is a very tough go, is thinking long and hard about ethical behavior). I think his adult journey would be another interesting book. 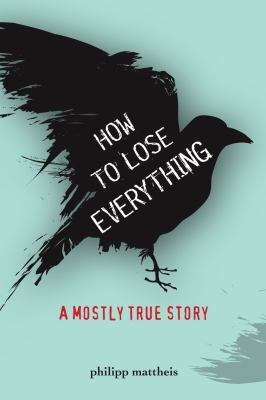 I recommend this title for most teens. The reading level is about 5th grade (a Lexile of 670), but the themes are mature. Unlike many books in the 600-700 Lexile level, the print is the size of a regular adult book (e.g. smaller than children’s and YA literature), and the length is typical for YA literature, about 200 pages. So if you are working on your reading skills, How to Lose Everything is an engaging way to take a step up into something longer—a bridge to books with more depth. This entry was posted in Adventure Stories, Controversial Issue/Debate, Family Problems, Fiction, Hi-Low/Quick Read, Mature Readers, Young Adult Literature and tagged abandoned houses, conduct of life, drugs, ethics, friendship, Germany, hi-low reading, high school students, Read 180, teenage boys, theft, YA fiction, YA literature. Bookmark the permalink.